We initially cross-posted an article written by Disclosure News Magazine and had no intention of following up on anything within that article, however, with the level of attacks posted on Disclosure’s and our Facebook pages in relation to this article, I did some digging. 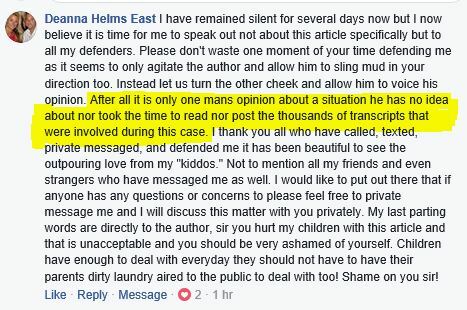 First, Deanna Helms East made her comment on our Facebook page claiming “this is one man’s opinion” and the author didn’t take the time to read all the transcripts (click here for her comment – click here for the Appellate Court’s determination in this case). The Circuit Court even found that Deanna’s conduct was “deplorable” – Para37. page 13 of the App Ct Determination. Finally, Deanna, do not ever say the author “hurt your children” for they are the ones that had to witness your deplorable conduct – that conduct the Appellate Court determined that you did commit and that the Circuit Court called deplorable. You are using your children as a shield, to somehow cast blame on the author of the article. I do not know why Disclosure did not publish this document (they tell us they did post the records the day following publication), but here it is, in all its glory. FAIR WARNING on the content of this document. It is disturbing. I won’t even attempt to be pithy about this situation of war between parents of three children. My pure and unknowing guess at what was REALLY going on: Adultery. There was a bad marriage going on for a long time and at some point adultery began, on the father’s, Matt, side. The adultery may have been with many people, thus the years of abuse Matt to which Matt attests and Deanna does not challenge. Deanna’s behavior and epithets, as described, would mirror, “hell hath no fury like a woman scorned”. Anyone can cheat, and many do. Of course she is angry and the lovers’ marriage incensed Deanna more. I don’t support her, nor her ex-husband. Still, everything that has happened is common and normal with the betrayal of adultery. Both men and women have killed their partners for cheating-stories we know-the diet doctor, murdered by the Madiera school teacher Jean Harris, Betty Broderick, Houston’s Deborah Davis just yesterday, October 24, 2017. We know that this human anger from being cheated upon can escalate from normal people into murder. Goggling this manifestation one finds it is almost a daily occurrence-a cheating spouse is killed by the other. At one time, if caught in the cheating act, murdering the offending spouse was excused as being “an act of passion”. Clearly Deanna has some very serious control issues-still, her anger is completely understandable and normal human behavior as known and accepted through the centuries. Her behavior is also, if it is adultery at the heart of the issue. But not acceptable in today’s society. Commit an “act of passion” today, you are still going to prison. She needs help to deal with her anger, which I believe is from the betrayal. If she reads this, I suggest she begin to process this situation via the “CHUMPLADY” website, if my assumption of the foundation of the situation is correct. I say this to Deanna, if I am correct-the next wife won a cheater. Wa-whoo. And if I am correct, why none of that was in the court opinions, is because none of that matters anymore, just like adultery is no longer grounds for divorce-just irreconcilable differences. “I don’t agree with your cheating and you think you will and do, therefore we can reconcile our disagreement about cheating vs. not cheating by a divorce. The civil solution trumps the murder solution in the 21st century. The first Judge, who read ‘all’ the documentation Deanna refers to may have included the facts I suspect, adultery. I have seen Judges rule in ways that effect a punishment upon Plaintiffs who are actually the parties that triggered the very events for which they then file a cause of action. Perhaps that is what the first Judge knew, the adultery, and why he did not issue an OP and further, why he minimized the Appellate Court’s instructions. But, again, I am only guessing about this adultery thing. Hmmm. Ok, so I’m confused. That happens when you get to retirement age. Did Coles Co. ever actually issue the OP as directed by the Appellate Court ? One would think perhaps that order might have constituted a judicial finding – and I guess the Appellate Court’s opinion / FINDING that Matt was an abused person- would itself constitute a judicial finding of fact sufficient to act upon by the school district…IF they became aware of it. The trick may be that Deanna was never arrested for domestic violence or any other criminal offense. Wonder what the school district personnel code and the school district / employee contractual language says about 1. an employee being the respondent in an OP and 2. having a judicial finding that an employee threatened or otherwise abused a family member or any other person…absent an arrest ? I think I have opined enough on this one. since it’s just my opinion. Carry on ! Yes, the OP was actually issued. This article was in response to Deanna’s own comment about the original author of the other article.